Add ghee (or butter) into saucepan, and set temperature to medium heat. Add apples, nuts, cinnamon, and salt. 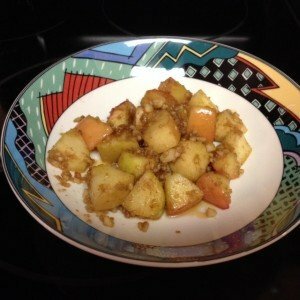 Stir well and continue to cook until apples are soft (10-15 minutes). Place cooked apples into serving dish, and top with a squirt of raw honey. You could stir in some coconut cream or heavy whipping cream.